I started to sew clothes when I was about 18 - I had just started university and didn't have any money to buy the clothes I wanted and I was also at that experimental stage in terms of image and identity trying to be too cool for school. My mum taught me to sew, and this dress was one of the first things we started together. I clearly remember measuring, cutting out and pinning it on the dressform, and there it stayed for several years even after I had moved out a year later! No reason for not finishing it, I just suppose that it was a style too sophisticated for an 18 year old (ie nowhere to wear that kind of dress). Fast forward 12 years and I have finally finished it! Ironically it only took a few hours to complete it, and thankfully it still fitted. To liven it up and give it a mod 60s feel I added black piping and some black buttons to the shoulders. Paired with a delightful pair of black and white gingham t-bar heels I recently purchased it made the perfect summer dress to wear to work. And yes this is another early morning shot taken in my front yard on my way to work - my neighbours must think I'm like, so vain to have my photo taken every few mornings in a new outfit! I just bought the latest available Burda World of Fashion magazine in a big bookstore in the city today - it's the December 2007 issue...... Yeah it's a few months late, but since we here in sunny Sydney are coming into winter in a few months it's actually good timing to get all the fabulous winter patterns in a roundabout way! Anyway, even though I buy the Burda WoF magazines and have accumulated quite a few, until now I haven't actually made any of the patterns. All the effort of tracing off the patterns and trying to figure out the correct sizing without going cross eyed seemed far too much effort for this little black duck, but after seeing so many totally hip and happening creations from it's pages I thought I'd finally give it a go. And here is my first creation - the pleated tulip skirt from the 09/2007 issue. This was such a quick project, once I had spent an hour tracing the pattern out. I couldn't figure out where the hip line was on this pattern due to the unusual pleating, so it was way too big at first, but a little taking in at the sides and making the pleats at the front a little deeper fixed that issue and now it fits perfectly. I made this from a brown linen, no stretch and maybe a little too heavy for this skirt because it doesn't really drape, it just folds and sticks out a bit. It is really comfortable too - the wide waistband sits at just the right height for me. So, this skirt may end up in a refashioning post shortly - I am thinking of converting the pleats and draping in the front to a plain centre seam with an inverted pleat to reduce the volume. I am mildy obsessed with suits - I have about twelve already and I just can't seem to stop making more. I do have enough reasons to suit up to come to work: I work in a corporate environment, I feel more in the mood for work when I'm wearing a suit, I don't like getting caught out for surprise meetings or presentations when I'm not dressed the part, and it makes me seem older (and therefore wiser) because I am relatively young to be in the managerial position I am. Hence, my own made suits are either vintage fabrics or vintage inspired styling. The Louis Vuitton inspired suit in the post below has made it into my regular summer work wardrobe, and with it's full skirt and little jacket it never fails to elicit comments from colleagues. The jacket pattern is Simplicity 3874, which loads of talented bloggers out there have used made the dress, although I've not seen the jacket in action yet. I modified the jacket by pleating the jacket body at the collar instead of gathering, lining the jacket, adding the piping and the single button at the front. It was very simple to make as the jacket has raglan sleeves and it sewed up in no time at all. The skirt pattern is Vogue 9615 (OOP), a lovely A-line shape skirt with a wide waistband, which I modified by adding the piping around the waist to match the jacket. The only thing that held me up on the skirt was two, yes TWO, invisible zips breaking on me and hence requiring the skirt to be taken apart to install a new zip. The fabric I used is an Australian wool, tropical weight, in a beige colour with fine grey threads running through it. I purchased it in 2005 from the fabric market in Shanghai of all places, because even though I am in Australia, Australian wool is verrrry expensive and the fabric, which is milled in China from raw wool shipped from Australia, is verrrry cheap there! It turned out very well IMHO, due to the simple lines of the design, the lightweight fabric which didn't too much interfacing to make this design work, and the little details of the button and the piping. I was rather busy this weekend, having the car serviced, going to a friend's 30th birthday party, dinner at my parents and cleaning the house for an upcoming extended visit by in-laws, so sadly I only got to visit one op shop in Parramatta of all places. Thanks Louis Vuitton for the inspiration! I'm not particularly into Valentine's Day rituals, never have been and probably even more so now that I'm married and that's all behind me. However, in the spirit (in spite of?) the lovefest going on (mostly by retailers), I'd thought I share something related to red, love and romance..... my wedding dress! My husband, an Australian born Chinese, and I decided to have a civil ceremony in the lovely Chinese Gardens in Darling Harbour, Sydney. So to match the setting, I chose to wear a traditional Cheongsam in the wedding colour of red. 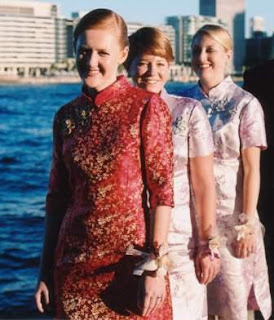 My lovely bridesmaids also played along nicely and wore cheongsams as well, in the lucky colour of purple (well lilac). Of course being the thrifty sewer I am, I made my wedding dress and the two bridesmaids dresses, and I even made my mum an outfit which she didn't wear because it turned out to be very hot that day indeed. 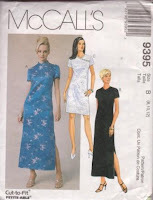 The pattern I used for all three dresses was McCalls 9395 (now OOP). The only modifications I made was to extend the sleeves to elbow length for mine. Here are the three of us having our photos taken in a very public place and doing our best to appear natural and not contrived. These photos were taken in Circular Quay, near the Sydney Opera House, and we had to line up and wait with other wedding parties for our turn at this spot (it's that popular!). I made the frog enclosures from braiding twisted just so and then sewed on (they are for decoration only), gold for me and silver for the girls. Hello and welcome to my blog. Yes, another blog about sewing but hey I can't be always be a lurker without contributing to the fantastic array of sewing based inspirational sites out there. So I thought I would start with a little post about fabric shopping in South East Asia, since I've just come back from travelling around Vietnam, Thailand, Laos and Cambodia for six weeks in December and January. And frankly, I'm still impressed and overwhelmed with all that I saw and a little unimpressed and underwhelmed with how little I bought in the end. It was so hot and busy there I obviously wasn't thinking straight! Vietnam: markets in Vietnam had so much fabric, but not that great quality and frankly rather boring selections as well. In Hanoi there are whole floors of rather uninspiring fabric in the markets, however in Hoi An there was a delightful little fabric market with some great cotton prints and lovely silk in varying weights. All the stall owners will readily do a burn test to prove the quality of their fabric. Total purchases: 5m black silk and 5m fuschia silk. Cambodia: I love love love Cambodia, beautiful country and the loveliest people. Things are a little dearer in Cambodia but still dirt cheap compared with everywhere else. I bought some lovely raw silk in the markets in Siem Reap, although the market places in Pnomh Penh have a huge selection also. Total purchases: 20m raw silk in purple, mint green, black and a purple/green colour.